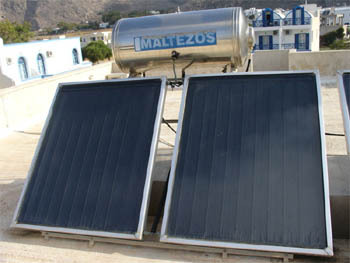 Solar water heaters are far more efficient and have a much shorter payback period than do solar photovoltaic systems. Getting heat from direct solar radiation is extremely simple (just step outside on a sunny day), and can be done with far less complex systems than what solar PV requires. Starting in 2010 all single family homes in Hawaii will be required to have solar hot water heaters. A bill signed by the state’s Republican governor, Linda Lingle, makes the state the first to require solar hot water for all new residences. A non-freezing climate like Hawaii does not even require the additional equipment needed to prevent freezing, as is needed in many other states in the continental US. While solar hot water would seem to be a no-brainer for Hawaii, it can be reasonably cost effective even in cold weather states. Rather than circulating the water directly, solar hot water systems either use an anti-freeze solution circulating in the lines, and then transfer the heat to the water with a heat exchanger. Or, solar hot water systems can be set up to drain back and empty the system on cold winter nights to prevent freezing, and only circulate water through the system when conditions are favorable. GreenBuildingTalk: Solar Hot Water and Heating — Is it Right for You?